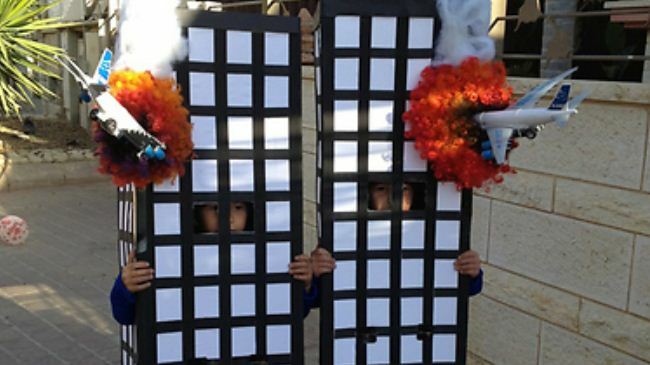 Israeli children dress up as the burning Twin Towers complete with impaled exploding airplanes to celebrate the Jewish holiday known as Purim. Another Israeli who visibly could not contain his joy at the success of 9/11's “Operation Esther” was Benjamin Netanyahu. When the once and future Israeli Prime Minister was asked about his reaction to 9/11, he said: “It's very good!” Then, catching himself, he added that while it wasn't exactly good, it was certainly good for Israel." In other words, Purim celebrates Jews lying, secretly penetrating the highest levels of government, and manipulating the leaders of an empire into mass-murdering perceived “enemies of the Jewish people.” That is exactly what the neoconservative Likudnik extremists - Wolfowitz, Perle, Libby, and the rest - did on September 11th, 2001. The only difference is that these modern, neocon Esthers would eventually kill millions of innocent people, not just 75,000. And if they succeed in tricking the US into attacking Iran on behalf of Israel, thereby launching World War III, today's neocon Esthers could kill tens or even hundreds of millions. Unfortunately for them - and for Israel - their wild celebrations did not go unnoticed. An American woman called the police, who arrested the four Mossad operatives, confiscated the thousands of dollars in cash stuffed in their socks, and held them for weeks. During their incarceration, the Israeli spies repeatedly failed lie detector tests. Nonetheless, they were secretly sent back to Israel, at the request of the Israeli government, by Israeli dual citizen and US Homeland Security Chief Michael Chertoff. Another Israeli who visibly could not contain his joy at the success of 9/11's “Operation Esther” was Benjamin Netanyahu. When the once and future Israeli Prime Minister was asked about his reaction to 9/11, he said: “It's very good!” Then, catching himself, he added that while it wasn't exactly good, it was certainly good for Israel. Netanyahu wasn't the only high-level Israeli caught celebrating 9/11. Another culprit was the legendary Mossad spy chief, Mike Harari. On September 11th 2001, as the dancing Israelis danced and Netanyahu chortled, “retired” Israeli Mossad Chief Mike Harari was in Bangkok, Thailand organizing a huge party to celebrate the success of his 9/11 operation. During the merry-making, Harari bragged to one of his associates, Dmitri Khalezov, that he, Harari, had been responsible for 9/11. (You can listen to my radio interview with Khalezov at http://noliesradio.org/archives/29582 .) Khalezov's testimony is supported by documents showing the fake IDs Harari was using in Thailand. All of the Israeli celebrations of 9/11 - so far - have been unofficial. But the Israeli government is on the record officially applauding another of its many attacks on the US: The 1954 Lavon Affair, otherwise known as Operation Susannah. In that covert operation, Israeli Mossad operatives, disguised as Egyptians, bombed American targets in Egypt. When the Israeli terrorists were caught by the Egyptian authorities and prosecuted, Israel denied any involvement and complained that the whole thing was an anti-Semitic smear. But later, as the Zionist website Wikipedia admits: “In March 2005, Israel publicly honored the surviving operatives, and President Moshe Katsav presented each with a certificate of appreciation for their efforts on behalf of the (Israeli) state, ending decades of official denial by Israel." When will Israel officially award a Certificate of Appreciation to its Mossad operatives who blew up the Twin Towers and WTC-7 and killed almost 3,000 Americans in order to launch a series of US wars against Israel's enemies? When Israel finally does admit its responsibility for 9/11, and lavish honors on the Mossad terrorists responsible, will it be during Purim - the holiday honoring Jews who seduce gentile rulers and manipulate them into mass-murdering their enemies?